In a fortnight it's back-to-school and therefore back-to-books with America's largest regional antiquarian book fair, the annual Brooklyn Antiquarian Book Fair, now in its fifth year and happening over two days on September 8-9 in Greenpoint, Brooklyn at the Brooklyn Expo Center. Today also happens to be the birthday of Mary Shelley, and in honor of her genius and magnificent creation of her monster, the fair is celebrating Frankenstein with a preview of the Morgan Library's forthcoming exhibition: It's Alive! Frankenstein at 200. The fair features several Frankenstein editions, including a third edition from Peter Harrington in London. Their copy of Frankenstein: or, The Modern Prometheus is handsomely bound in brown half morocco with Johannes Schiller's The Ghost Seer and Charles Brockden Brown's Edgar Huntly; or, The Sleep Walker. Published in 1831, its spines are lettered in gilt, with illustrated title pages by Theodor von Holst. 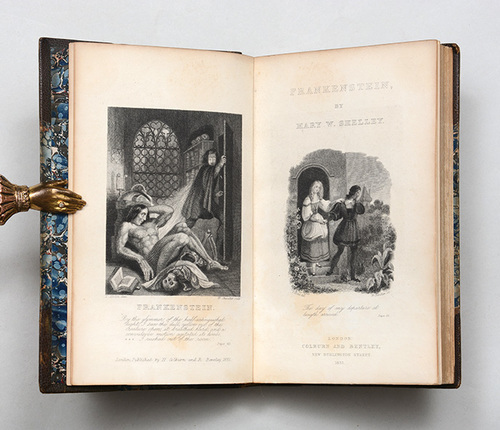 This is the first illustrated edition of Frankenstein, the third overall and the final definitive text and, Harrington notes, the first to gain true popularity. Shelley incorporated most of the changes introduced by William Godwin in the second edition. It also includes her now famous introduction in which she describes her haunting nocturnal storytelling session with Shelley, Byron, and Polidori at the Villa Diodati. The frontispiece is the first book illustration showing Frankenstein and the Creature. Next week we'll share more items at the fair. For today, happy birthday to Mary Shelley, who wrote a masterful work of genius as a teenager, a fact doubted by many literary critics and scholars over the years, who prefer to assign her husband with the credit.